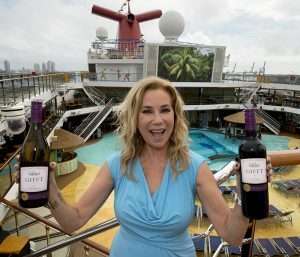 At an event onboard Carnival Breeze Sunday, Gifford greeted passengers boarding the ship for their six-day Western Caribbean cruise with samples of her wine, available by the glass or the bottle. “It’s like coming home again,” she said. Gifford became spokesperson for Carnival in 1984, appearing in highly successful campaigns such as “If They Could See Me Now” and “Ain’t We Got Fun?” (check them out on YouTube for a blast from the past). She served in that role until 1996. Gifford’s formal relationship with wine began last April, when she partnered with Scheid Family Wines, one of the largest vineyards in Monterrey County, California. The Gifft Collection consists of a Red Blend and a Chardonnay. Both wines are estate-grown and priced under $20 a bottle. In September 2014, Wine Enthusiast magazine gave the red 91 out of a possible 100 points, while the Chardonnay earned 88 points.